Automatically monitors 7+ million blog postings each day in 75+ million blogs and delivers daily reports of new mentions of your company name, products, brands, issues. Bloggers are frequently the "early adopters" of new products and ideas. As online publishers, they have emerged as important "influencers" on products and ideas. BlogSquirrel blog monitor is today's most thorough, practical and cost-efficient blog searching and monitoring service, capturing vital information and viewpoints that help you better understand what consumers are saying about your company and its products, thereby helping you make timely decisions and manage more effectively. With the BlogSquirrel online blog searching and tracking service, you automatically search and clip the new content in over 75 million blogs each day and receive daily (or more frequent) reports of new blog postings containing key words you've specified. CyberAlert offers a 14-day No Risk Free Trial of its blog searching, monitoring and clipping service to corporations, government departments, not-for-profit organizations, and public relations / marketing agencies. No credit card required. By using BlogSquirrel blog monitoring service to automatically search, monitor, and "clip" relevant blog content, you and your organization can build an effective "early warning system" to identify problems and issues that may threaten corporate or brand reputation … or present new opportunities for business growth. Nobody monitors blogs better than BlogSquirrel. Nobody matches the advanced features and benefits of BlogSquirrel blog tracking service. Nobody offers better value than BlogSquirrel. well-filtered information while saving you time and money. Get started today! 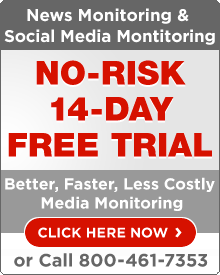 Order your No-Risk 14-day FREE TRIAL of BlogSquirrel Blog Monitoring Service Now! Monitor your own key words in 75+ million blogs each day. Zero cost. No credit card required. Product Brochure and Pricing Information. You work hard to earn your media placements. You want a media monitoring service that will work just as hard to find all your media clips. Here's my personal pledge to our customers: CyberAlert will work as hard as you do and will always do what's best for you. You can trust us to do the best possible job for you.